Ben Carson and Rand Paul each hold an M.D. 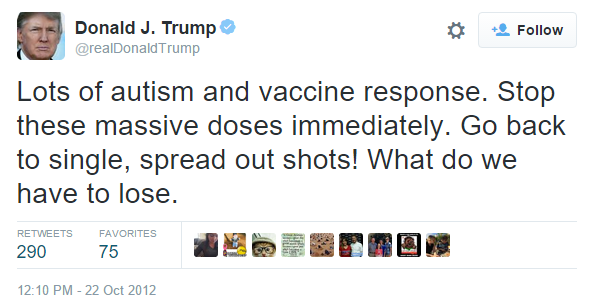 so I had hope that they would shoot Mr. Trump down and put a stop to two baseless myths about vaccines. Instead, Dr. Carson said that there is proof that autism is not associated with vaccines but “we are probably giving way too many in too short a period of time.” Rand Paul followed suit saying, “Even if the science doesn’t say bunching them up is a problem, I ought to have the right to spread out my vaccines a little bit at the very least.” Refusing to stand up to unsubstantiated myths about lifesaving vaccines is a disgrace to the medical profession and dangerous for the population – but that’s for another post. (B) Vaccines should be administered in smaller doses and spread out. Vaccines do not cause autism. In the scientific and medical communities, there is no debate on this issue because the data are clear. You can ask the Centers for Disease Control and Prevention, the National Institutes of Health, the American Academy of Pediatrics, the World Health Organization, and the Institute of Medicine (to name a few) and they will tell you that, whether administered alone or grouped together, vaccines do not cause autism. The CDC maintains an excellent page here that goes into great detail about the safety of vaccines and the research that has been conducted to determine whether vaccines play any role in the development of autism. How many antigens is a child exposed to (by immunizations) by the age of two? Approximately 153. So, does the evidence support any of Donald Trump’s claims? The answer is a resounding NO.